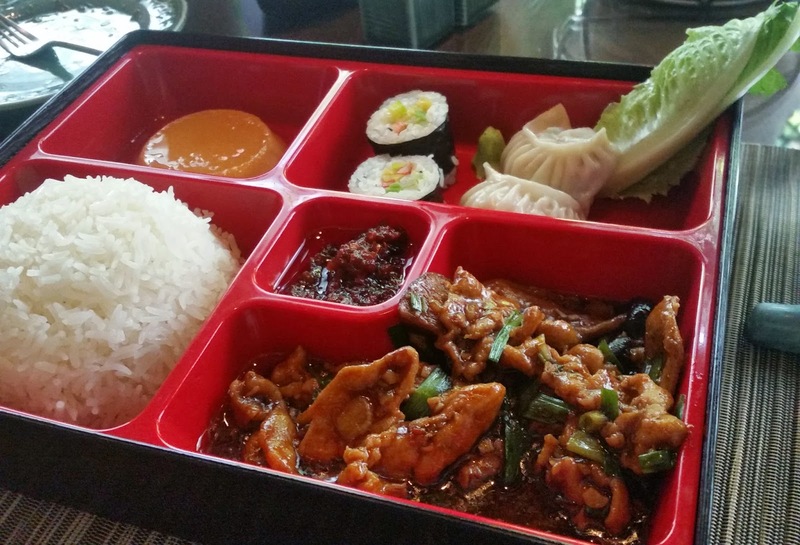 Mekong, the Pan Asian restaurant of Marigold Hotel, Hyderabad has introduced an executive lunch which is served in such a Bento Box. This is a quick lunch to be served under ten minutes, so that on a busy office day, people can have a complete meal under 30-40 minutes. The restaurant has a special fixed menu with three different combinations for the Bento Box and one can choose any of them. The Bento Boxes are priced competitively at Rs 700 (all inclusive). A friend hosted me for a Bento Box lunch here. We quickly made our choices and as we waited for the food. 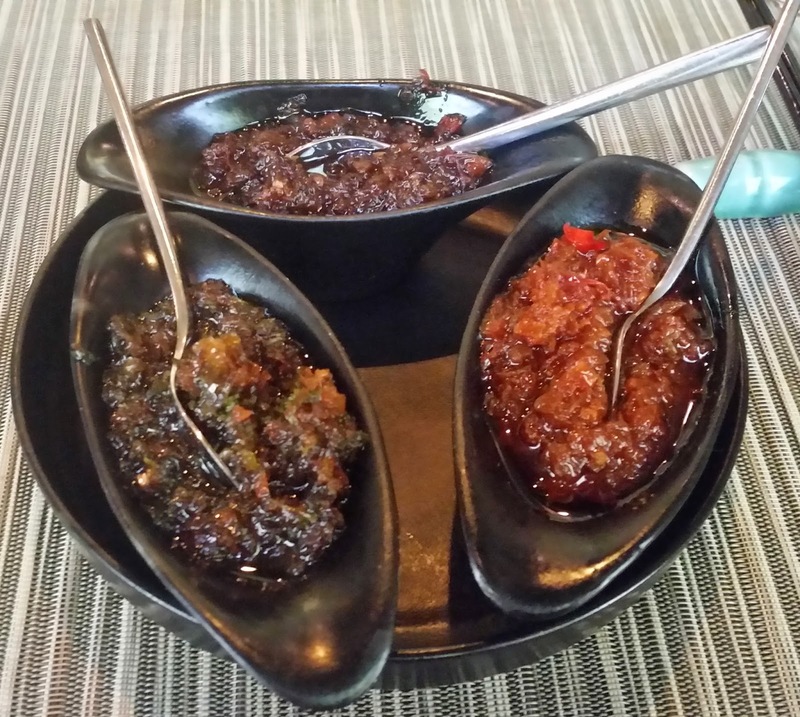 A set of crackers (oriental papads) were served on the table along with three dips – Szechuan, Chilli Basil and Chilli Coriander. All the three dips tasted remarkably different but good and I overate the crackers just for these. Flavorful Jasmine Tea was also served in small cups which was enjoyed standalone and used as a palate cleanser between courses. My choice for a Bento Box had Crab Ura Maki and Chicken Gyoza as starters. The Crab Ura Maki sushi had rice on the outside and soft crab meat in the inside. Gyoza is essentially a dumpling stuffed with chicken (akin to momos). A small compartment in the box had a soy based sauce which went well with the starters. I had tough time negotiating the Uramaki as the rice kept falling out, but the taste more than made up for it. For the main course there were two medium sized pieces of Salmon Teriyaki. The teriyaki sauce on the fish tasted quite good along with Peas and Garlic Rice. The rice was also gorged with the three dips which had to be refilled. The dessert was a piece of Malaysian Pudding. My friend had another set - with Chicken Momos and Shitake Mushroom based sushis as starters. The main course for him was Chicken Katsu Curry with Fried Rice. Sticky Rice Pudding was the dessert in that platter. 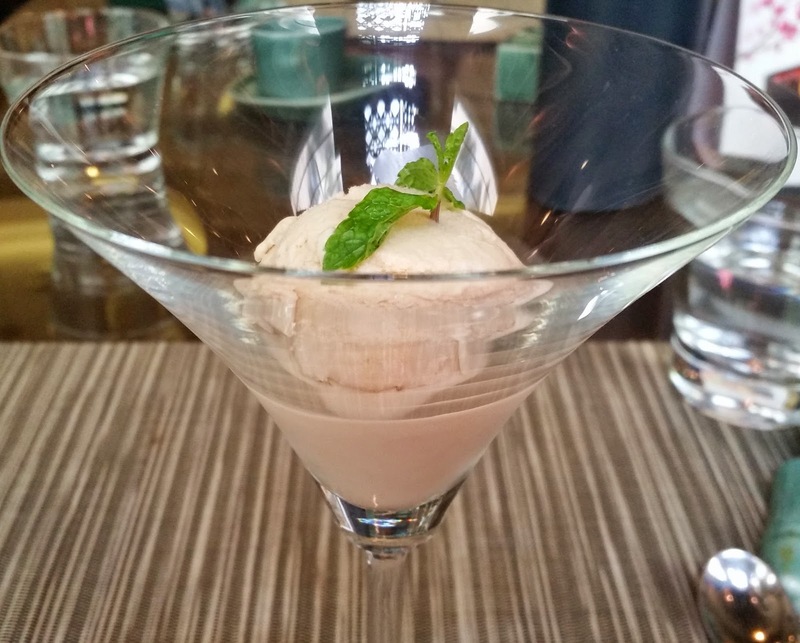 I am a big fan of the Jaggery Ice Cream (Rs 350), so we finished our meal with the delightful preparation. Apart from the concept of a quick meal, trying out the Bento Box is also a good way of trying out Japanese food in Mekong – you get two types of starters, one main course and a dessert for just Rs 700. A word about the quantity – while it may be sufficient for a light eater, a heavy meal may need another item to be ordered. An idea which came to my mind was taking all three versions of Bento Box and sharing among two people. 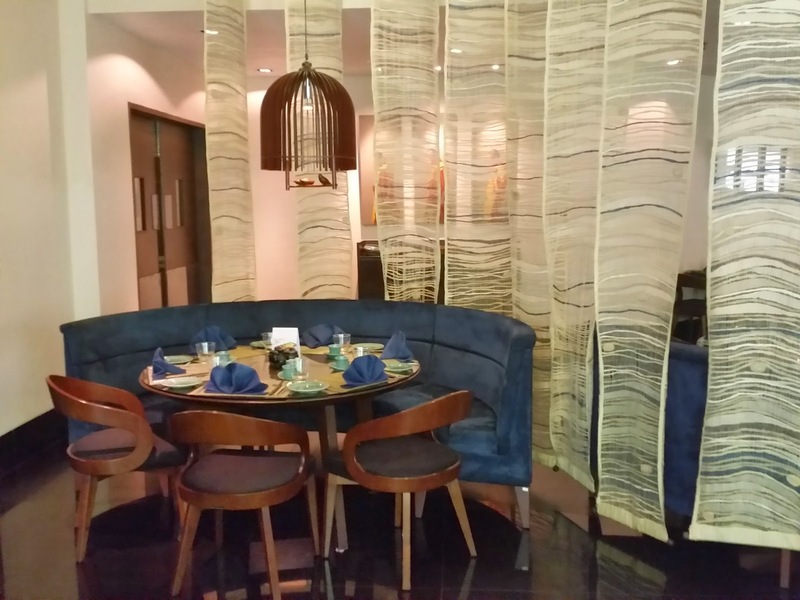 This way you get to taste 6 types of starters, three main courses and three desserts albeit in a small quantity - a very good and heavy lunch for two people at Rs 2100. 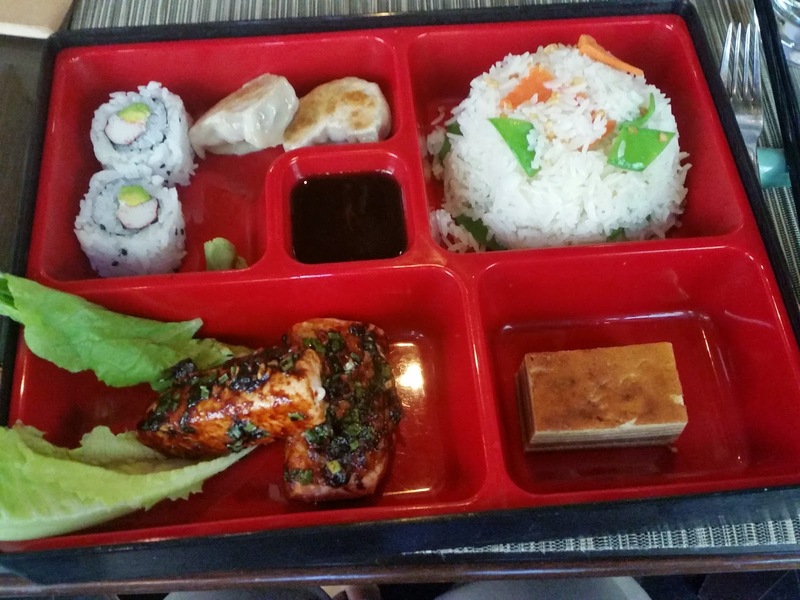 The Bento Boxes are available for lunch Monday to Friday. I am going back soon to try the other two combos.